Continue to search for quality books with lovely illustrations and stories of real life. Keep looking for books to support your child's language explosion. If your child has a strong interest in tools, in addition to showing him the real tools—hammer, screwdriver, drill, etc.—you can look for books that support his interest, such as ones with colourful illustrations of tools or one about a carpenter. Pop-up and lift-the-flap books have great appeal at this age and are idea for encouraging interaction around the words in a book. 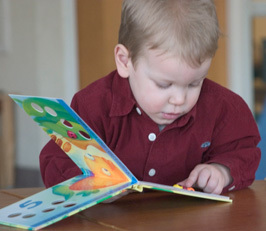 Toddlers will continue to enjoy books of familiar routines and situations, but they also will begin to take an interest in pictures filled with information, action, and detail. Find songs that have more complex language and structure now. Your child can grasp a lot of words at this stage so keep feeding this hunger by offering them. Songbooks with refrains, sound effects or actions to imitate are particularly good choices for this age. Books with rhythm, rhyme, and repetition help build literacy skills. When your child is familiar with a book you can have a conversation about the people and events in the story and compare your child's experiences to those in the book. When reading predictable books with repeated text and with pictures that correspond to the text pause when you read aloud to let your child fill in a word or phrase. Make up actions to some of your child's favourite songs so that you can do them together. The actions will help your child to understand and interpret meaning. Continue to have a place and time to read and sing songs as part of your child's regular daily routine and as an important part of his bed-time routine. A quiet story at night laying on your child's bed with him can be wonderful at inducing sleepiness and signalling the end of the day.